Training with positive reinforcement means that the pet’s behaviours that we want are rewarded with something they want. In training, reinforcement is something the animal will work to gain - i.e. anything that, when combined with a behaviour, increases the likelihood that it will be performed again - like us, animals are individuals & may find different things reinforcing, so we “interview” our pets to find out what they like & are keen to work for! Modern behavioural science tells us that this is how animals (& humans) learn. This type of training is based on sound research & teaches animals what we want them to do & how to do it successfully - as opposed to punishment, which creates fear & confusion & doesn't give our pets any information about what we want from them. Correctly used, positive reinforcement training ensures that animals are treated kindly & fairly, with no stress or aversives, & that they learn in a way that creates focus, confidence & enthusiasm. Learning is defined as a change in behaviour due to certain types of experience - so let’s make sure they’re good ones! At Inspiring Pet Teaching, we keep it positive, never using coercion, aversive or punitive methods for training as they are unkind, unfair & don’t help animals to succeed. Clicker training is a form of force-free, positive reinforcement training. It is a way of communicating with our pets to provide information about what’s right, i.e. that the pet has correctly performed a particular behaviour that is liked by us. The "click" is a marker - it should be instant, consistent, neutral & different from anything else the pet is likely to be familiar with, & only used in the training setting - it’s like taking a snap-shot of exactly the behaviour we want! We use this marker as a "bridge", given instantaneously during the performance of the right behaviour, & it allows timely delivery of the reward for success. The marker is given meaning/value by pairing each click with a reward (e.g. food, fun, toy, etc) - click means "you did the right thing; a treat is on the way as a reward for being brilliant". If used appropriately, it cuts out the potential for confusion or misinformation for the pet, meaning we always “catch ‘em in the act”... of doing something good! Clicker training can be used to teach any animal anything it is physically & mentally capable of doing. Clicker training creates enthusiastic learners who are in control of what happens & are willing to take a chance on what will make the trainer "click", safe in the knowledge that nothing bad will happen. Because the learner has taken the initiative & intentionally performed a behaviour - training becomes a team effort, rather than "you do what I say". This tends to create a deeper understanding of learned behaviours & result in their lifelong learning. This method results in confident learners, who enjoy learning &, when applied to our pets, strengthens/deepens the human-animal bond - both sides learn & have fun together! How should I prepare for training Lessons? Preparation for training is easy! Simply contact Pawsitive Pet Teaching to check availability & scheduling of group classes, fill in your registration form, check the list below & you’re ready to go. We normally visit your home. Please ensure that your pet has a safe, comfortable place to be before I arrive, where they can rest away from the stress/excitement of a new person, with something great to engage them, e.g. a long-lasting chew/frozen Kong™. ), puzzle-feeder, etc. They should feel comfortable & relaxed here, rather than frustrated/stressed - you may like to do a few "test runs" to ensure success +/- "interview your pet" to ensure the distraction you have given them is a) long-lasting/engaging enough, & b) desirable enough to beat visitors! At your first 2-hour appointment, we will consult for ~1 hour before working with your pet. You may want to write down anything you’d like to discuss (it's easy to forget what you wanted to say! ), collate any video, etc. & browse through check the list below to ensure you have everything you need for training before I arrive. You may like to take notes as we talk too. Should we be meeting elsewhere, please see the list below for what to bring. Please keep your dog in the car (& stay with her), until we have spoken to make a plan. What should I bring to group classes? Treats - & plenty of them! Bring a selection of ordinary & super-delicious treats - don’t be stingy! Tiny pieces are best - try to buy or divide tasty treats into ½cm-sized pieces (no bigger than a piece of sweet corn). A flat collar (no choke/half-choke or prong collars please) &/or a well-fitting body harness that allows freedom of movement. A strong 3-foot-ish lead appropriate to your dog’s size/weight - no flexi-leads please. You may find double-ended training lead helpful in class too. Please enter the class one at a time in a calm & orderly way. Remember - class doesn't begin in class! Dogs learn from all experiences, so let's make sure they are learning the right things, even before they get into the classroom! Shy dogs should arrive a little early & come in first. We would prefer it if you don’t allow your dogs to meet & greet +/- play with +/- bark at other dogs on the way into & out of class - even if your dog is relaxed & friendly, for medical or behavioural reasons, other dogs & owners may not feel comfortable with interaction at close-quarters - also, it could result in hyped-up wild things who cannot focus in class! Sign up for YouTube - we will often send you video tutorials to support the skills we teach in class. An hour can fly by, & there's a lot to do & remember, so it's often helpful to have an aide de memoir! A small rug to help settle your dog. Treat pouches can be invaluable to free up your hands & ensure you've always got something yummy nearby to mark that wonderful behaviour! Something safe for your dog to chew, e.g. a stuffed Kong™. A wrist-strap for your clicker, so it's always there when you need it! A carbineer clip to attach you dog's lead to your waist/belt so your hands are free. Any props you’d like to work with, e.g. for our Tricks classes. Make sure you're prepared for class - find everything you need at our affiliate Pet Store! Please send your payment & registration form as soon as you confirm your place in class - your space cannot be confirmed without this! For the first (orientation) class, please send a copy of your dog’s vaccination certificate a week in advance. Your vet will be able to provide written proof, should you not have your certificate to hand. Please feel free to contact Inspiring Pet Teaching with any questions about specific questions. What is a dog-free orientation class? Many of Inspiring Pet Teaching’s group training courses commence with a dog-free orientation class. This “just for grown-ups” class introduces you to the content & concept of the course, teaches you a little about how dogs learn & how to listen to what they are telling you, & reply in a way that makes sense to your dog! We do fun exercises & games to improve your training abilities & teach you some clicker skills. 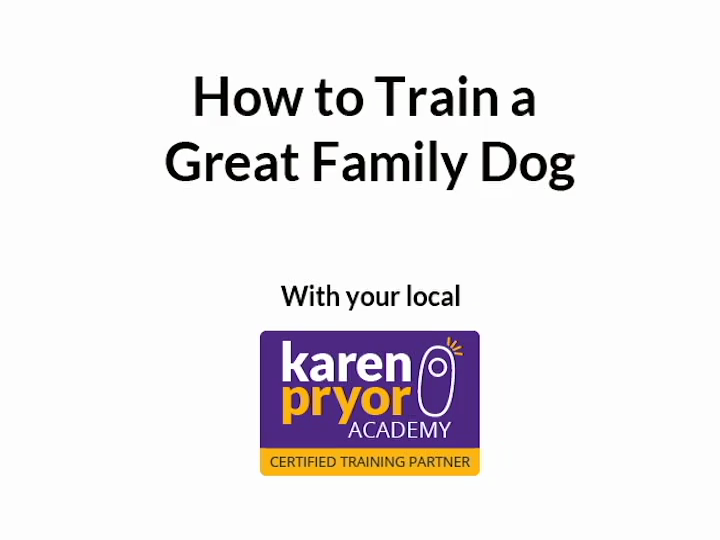 All of this ensures that you are ready to give your best to your dog & hit the ground running when she joins you in her first class the following week. Orientation classes last approximately 1.5 hours. What happens if I miss a class in my course? We don't want you & your dog to miss out! Once you have registered & paid for your dog's training course, you can catch up if you have to miss a class due to unforeseen circumstances. Depending on availability, we can slot you into another class, or offer discounted rates on a one-to-one catch-up lesson. Please contact us for further information. Do I need to be referred to Inspiring Pet Teaching by my vet? No. Whilst Inspiring Pet Teaching welcomes veterinary referrals & works closely with veterinary colleagues, we are very happy for you to contact us directly to self-refer. We offer the option of updating your veterinary practice on your pet’s progress, but will respect your privacy & any wish not to do so.